they were clever and started to build a nest in the feeder! The leaves are beginning to change here, as you can see on the cam. The air is getting much cooler and lots of critters are stocking up on extra calories to prepare for the snow and colder weather. I've noticed that Scramble and the chipmunks have really been cleaning out the feeders. I've been replacing seed daily now. 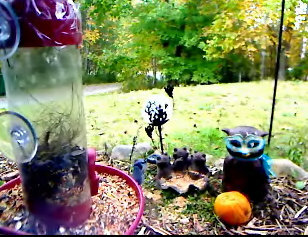 Bluejays are also showing up more frequently and even perching on the main cam feeder. Hopefully these critters will stay through the winter, with the exception of the chipmunks of course, who will be beginning to hibernate soon! Stay tuned to the cam. As we approach Halloween, some peculiar things may begin to show up!